The mission, to launch the Arabsat-6A communications satellite into a geosynchronous orbit, saw Falcon Heavy lift off from Cape Canaveral at around 23.35 BST on Thursday, April 11. Just over two and half minutes into the flight, the rocket’s two side boosters separated, landing safely back at Cape Canaveral a few minutes later after controlled re-entry burns. While this feat had been achieved during Falcon Heavy’s debut launch in 2018, on that occasion the vehicle’s stage 1 core booster – which flies higher and further downrange than the side boosters – crashed into the sea. This time, however, the core booster successfully landed on SpaceX’s drone ship “Of Course I Still Love You”, stationed in the Atlantic Ocean off the Florida coast. The hat-trick of landings marks the first time all three stage 1 rockets have been recovered from a SpaceX launch vehicle. 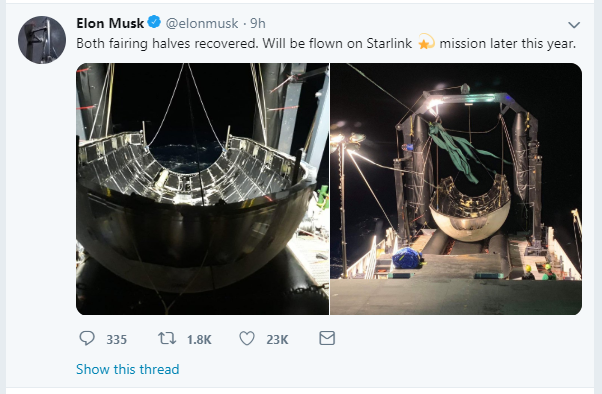 According to a tweet from SpaceX CEO Elon Musk, both fairing halves were also recovered from the ocean, and will be reused on a Starlink mission later in the year. If the company can continue to recover rockets and fairings following its launches, it should be able to significantly reduce the cost of commercial space flight. The fact that all recovery attempts on Falcon Heavy’s first commercial mission were successful is a major boost for SpaceX and Musk, whose other major company, Tesla, is struggling to meet its production targets. Approximately 34 minutes after the launch, the Arabsat-6A satellite was deployed in orbit. Built on Lockheed Martin’s LM 2100 platform, the high-capacity telecommunications satellite will deliver television, radio, Internet, and mobile communications to customers in the Middle East, Africa, and Europe, including advanced Ka spot beam services. Musk is allowed to fire rockets yet Kim Jong gets a visit off Trump? Adam!!! Mr. Musk is not threatening to put armed warheads on his rockets. I think you Brits will eventually take game, set, and match with the new SABRE engines that are air-breathing fiery monsters!